Are you wilting in the Chennai heat? 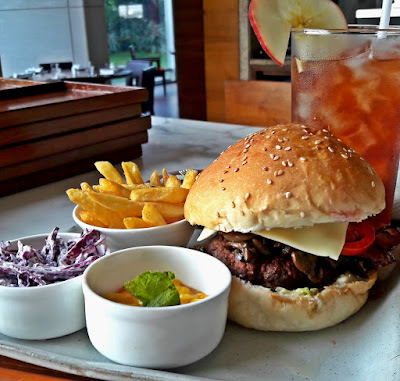 The Lobby Lounge at Hyatt Regency Chennai must be one of the coolest places in the city right now because you can chill out at their smokin' burger - burger and iced tea promotion. If that sounds cheesy, it's because I've been looking at burger patties draped with cheese slices all afternoon! 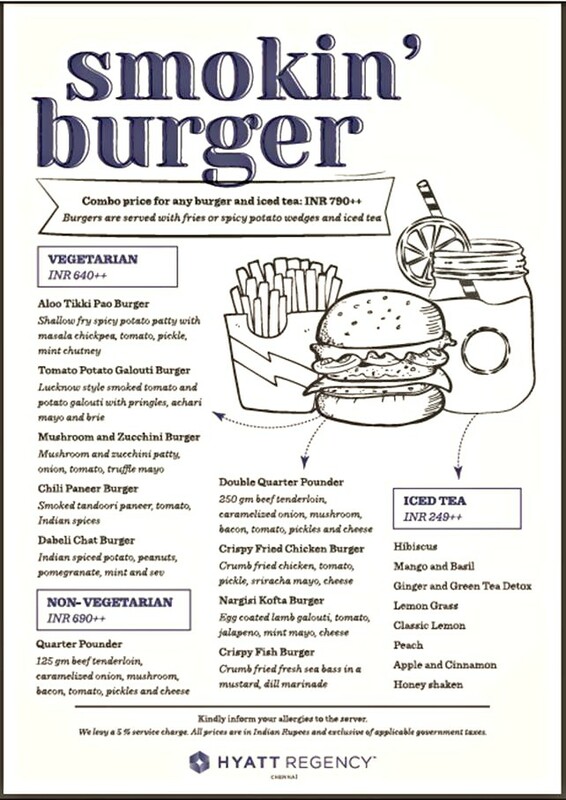 There are 5 veg and 5 non-veg options for the burgers and 8 iced tea flavours. 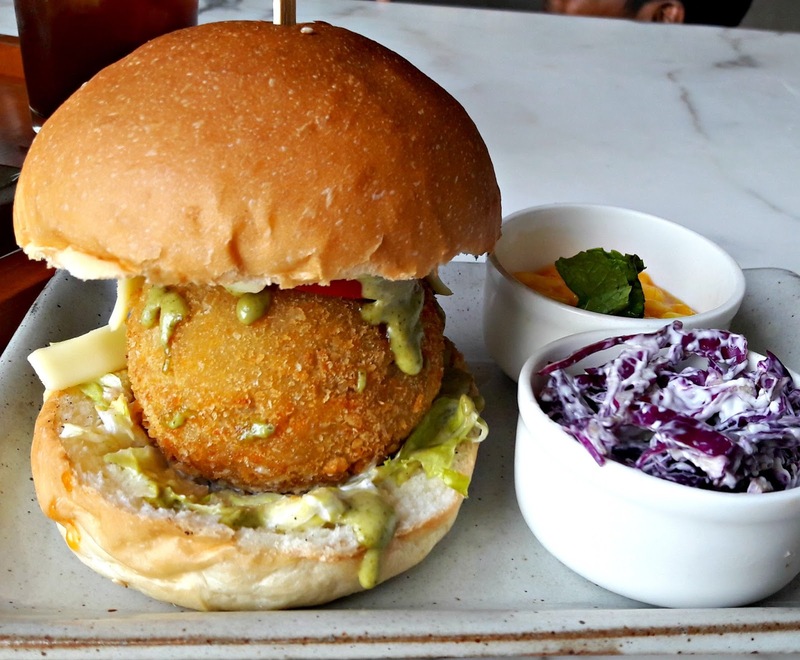 The veg fillings sounded quite unusual, at least to me - dabeli chat burger where pomegranate arils and sev would add a wonderful crunch to the potato patty. Even the Lucknowi style tomato and potato galouti with Pringles and Brie would have been my choice if I were still on Lent. 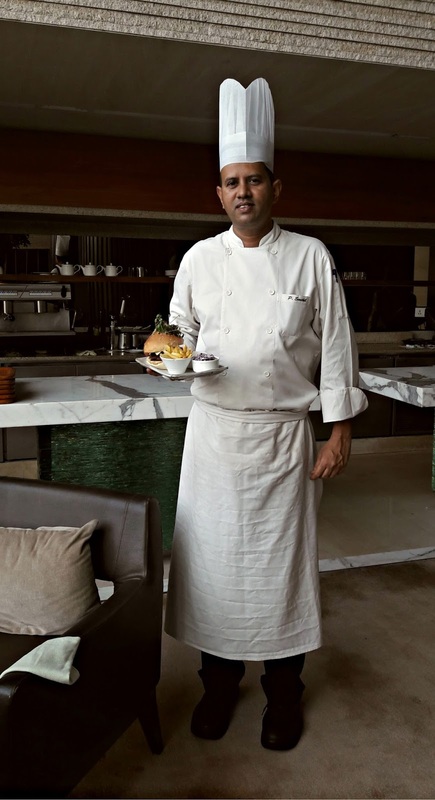 Chef de cuisine Senthil's burger menu definitely has some stars on it. My mango and basil iced tea came in a huge glass with plenty of ice and a lone slice of mango. 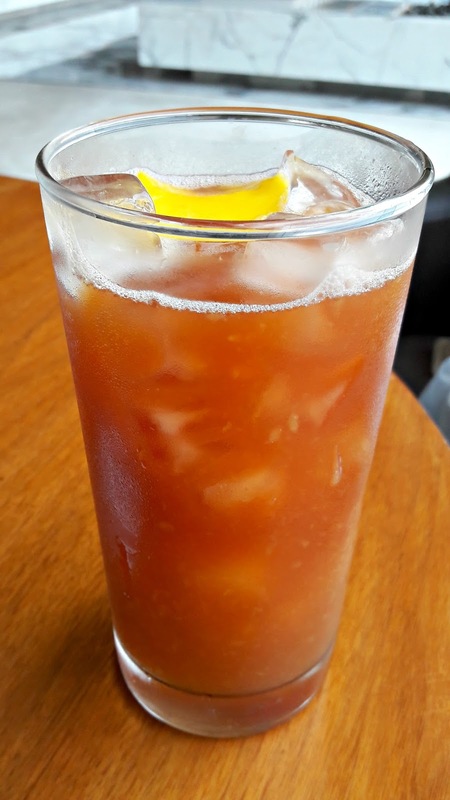 The ice cubes diluted the drink considerably that it flattened out both mango and basil flavours. The addition of a little more mango puree and sugar syrup was all it needed though a sprig of basil and a few basil seeds floating on the top would have been a treat for the eyes. The tea component was of good strength and brewed just right. 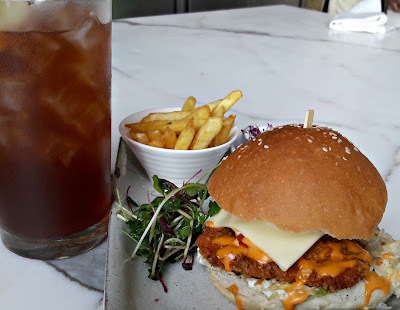 I opted for a non-veg combo. While waiting for it, Chef Senthil brought out the Nargisi kofta burger. A whole boiled egg covered with lamb galouti and fried, served with jalapeño, cheese and mint mayo. Sounds awesome, right? I love a good fish burger and the fish burger slider did not disappoint. 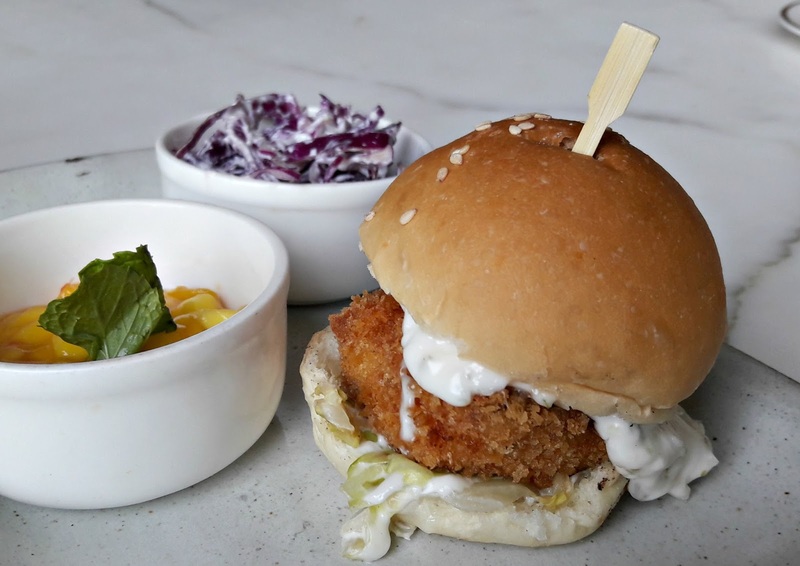 A fresh fillet of snapper crumb fried to crisp perfection, a slice of cheese and gherkin halves and anointed with a tangy tartar sauce. Simple flavours and done right. I wasn't asked how I wanted the meat in the quarter pounder done - it was well done but still moist and not cardboard-y though I would have liked the bacon to have been grilled a little less! A slice of cheese, tomato, gherkins, caramelised onions (yummy), sauteed mushrooms, lettuce and mayo filled the bun. The bun was soft and held on without disintegrating till the last bite. The burgers came with a red cabbage slaw, fries (or wedges) and a delish mango salsa along with jars of ketchup, mayo and mustard. Vegetarian burgers start from 640/++, non veg from 690/++ and I did think that the burgers could have been a little bigger in size. The promotion is on at the Lobby Lounge till the end of April.